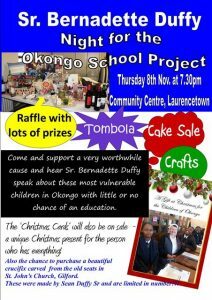 Please try to come along to the Community Centre on Thursday 8th November from 7.30pm to support Sr Bernadette’s latest project. Hear Sr Bernadette speak about these most vulnerable children in Okongo. Cake sale, crafts, tombola and raffle on the night with lots of prizes, “Christmas Cards” will be on sale and the chance to purchase a beautiful crucifix carved from the old seats from St John’s Church, Gilford.